Suffolk County police officials say they plan a Thursday afternoon news conference to “briefly discuss a new investigative resource to aid” in the Gilgo Beach homicide investigation. The FBI is assisting Suffolk police in the Gilgo Beach homicide investigation to take a “fresh look” at the case, Deputy Police Commissioner Tim Sini said Thursday. “Rest assured, this case remains active,” Sini said, one day before the five-year anniversary of the case. Police officials “determined that the best course of action was to take a fresh look at these murders,” and to involve the FBI, Sini said. Police Chief Stuart Cameron addresses the media. 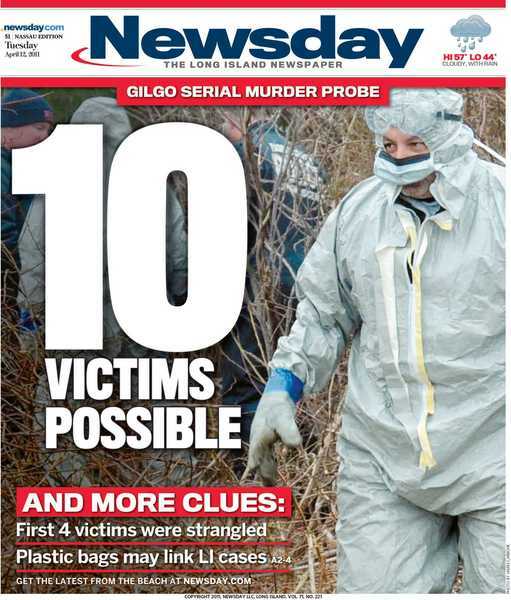 Cameron: We were able to discover the remains of 10 human bodies and Shannan Gilbert. Deputy Police Commissioner Timothy Sini addresses the media. Sini: I want to convey that we are dedicated to do everything we can to solve this case. Sini: Rest assured this case remains active. Sini: Cameron and I determined the best course of action is to take a fresh look at Gilgo. Sini: We've invited the FBI to take a fresh look at these cases with us. Bringing the FBI to the table, is a step in the right direction. Sini: From my own experience, I know that oftentimes cases are only solved after local PD works with federal partners. Sini: We are not going to comment specifically on the details of the investigation. Sini: The Suffolk DA's office has been tremendous in assisting the police. We'll continue to work with our partners in the DA's office. Sini: This is an active investigation. Sini: We're doing everything we can to solve these murders. Sini: Not going to comment on the specific steps that the FBI is going to take, the resources that the FBI is going to offer. The FBI will be taking a more active and prominent role in this investigation. Sini: The FBI being a federal agency has resources that they can bring to the table. They have expertise in serial murder cases. Sini: We're not going to do anything that will shed any sort of doubt that we didn't do everything we could to solved these murders. Sini: Certainly we're not going to comment on any details regarding theories in this case. We are going to move forward and take a fresh look at this case. Sini: We want to make sure we're doing everything we can to solve these murders. I know the benefit of bringing federal law enforcement officers to the table. Sini: This is clearly an important case to the Suffolk County Police Department. It always has been. Sini: We'll be in close contact with the FBI in the coming weeks to hammer out the details. Sini: I do bring my experience as a homicide prosecutor. The fact that we're taking new steps in this case obviously shows our commitment. Sini: We don't want to go into when tips have come in or any other details of the investigation. Sini: We're not going to go into what conversations have been had with victims' families. I want to assure everyone watching this investigation that the Suffolk County Police Department is committed 100 percent to solving this.